Balboa (near) Hull on Wednesdays! Hello and welcome to Kingston Swing's Wednesday night group. Wednesdays were dedicated to teaching our popular Balboa classes but currently we are taking a break. We will announce on here and our Facebook page when we are back up, so please call back soon. When running the class meets at 'The Assembly Rooms', Bridge Street, Barton, HU14 3AA at 7:45pm. As with our Monday night classes, there will be two 40 minute linked classes rotating through a variety of footwork patterns and social dance moves. The lessons will cost £4 per night. Lessons are aimed at absolute beginners and will be designed so that anyone can join in any week. No partners are required and comfy flat shoes/trainers are advised. The dance is extremely fun and an enjoyable way of keeping fit. There will also be tea/coffee/soft drinks provided in the break. The "Balboa" got its name from the Balboa Peninsula at Newport Beach, situated on the coast about 40 miles south of Los Angeles in California. 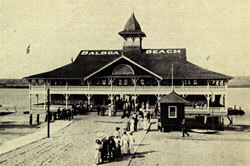 The dance was first performed at the beach Pavilion and then latterly at the famous Rendezvous Ballroom (lindycircle.com, 2015). Balboa is an 8 count dance and using the 'pulse' of swing music is extremely important to make the dance look smooth and connected. As such there is a strong sense of musicality when dancing Balboa. Pure Balboa is danced completely in closed position however the pure form evolved into what is now known as 'Bal-Swing', this means there can be some overlap to other dances such as Lindy Hop so long as the overall style, feeling, and framework remain true in spirit to the original dance. The dance developed in the 1920's. By the early 1930's it had become sufficiently well known to be given its name. It is very well suited to fast tempo music meaning above 185+ beats per minute however it can be danced to slower swing music too. Join our Facebook group here : Kingston Swing 'Balboa in Barton' for up to date info.